On 14 December 2014, a delegation of Australian Bishops from the Australian Catholic Bishops Conference as well as the Conference of Bishops and Representatives of the Middle Eastern Apostolic Churches in Australia and New Zealand departed to the Middle East to be with displaced Christians in Erbil, Iraq and refugees in Lebanon, offering spiritual support and humanitarian aid in this Christmas season. The delegation comprises: Most Reverend Christopher Prowse, Archbishop of Canberra and Goulburn, Most Reverend Julian Porteous, Archbishop of Hobart, Most Reverend Robert Rabbat, Eparch of the Melkite Eparchy of Australia and New Zealand, Most Reverend Mar Jibrael Kassab, Archbishop of St Thomas The Apostle Chaldean and Assyrian Catholic Diocese of Australia and New Zealand, Most Reverend Antoine-Charbel Tarabay, Maronite Bishop of Australia, Most Reverend Bishop Daniel, Coptic Orthodox Bishop of Sydney and Affiliated Regions, Most Reverend Danil Bolis, Archbishop of the Ancient Church of the East. 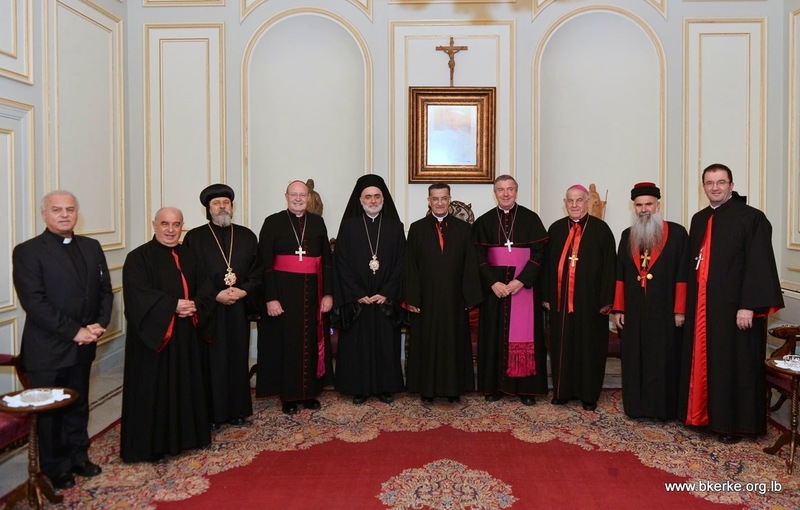 Prior to the their arrival in Lebanon, both, the Conference of Australian Catholic Bishops and the Conference of Bishops and Representatives of the Middle Eastern Apostolic Churches in Australia and new Zealand, took the initiative of designating Sunday 7 December 2014 as a Day of Solidarity with the Christians of the Middle East in response to the recent tragic events. Around 120,000 Iraqi Christians were forced to flee their homes by the end of June 2014 and resettle in Iraq, Lebanon, Turkey and Jordan. These people are living in terrible conditions and they are gradually losing hope of returning to their homes and are worried about the future of their families and children. The aim of the visit is to show support before Christmas and to try and alleviate their suffering and listen to their needs. Upon their arrival to Beirut, the delegation was welcomed by Archbishop Paul Sayah, Patriarchal Vicar General, representing the Maronite Patriarch Cardinal Bechara Boutros Rai, Bishop Michel Kassarji, Chaldean Church in Lebanon, Mr. David Windsor, Charge d’Affaires of the Australian Embassy in Lebanon, Father Paul Karam, President of Caritas Lebanon, Father Abdo Abou Kassem, Director of the Catholic Media Center and Father Louis Ferkh, Coordinator of the Office of the Global Maronite Expansion. Following that, Bishop Antoine-Charbel Tarabay talked about the mission’s ecclesiastical, spiritual and humanitarian aims and outlined the delegation’s scheduled program in Lebanon and Iraq, which includes meetings with authorities as well as refugees to listen to their stories and needs. Following the press conference, the bishops departed to the Maronite Patriarchal See in Bkerke, where they met with His Beatitude and Eminence Mar Bechara Boutros Cardinal Rai, Maronite Patriarch of Antioch and All the East, who called this visit a blessed initiative by the Australian Bishops. His Beatitude was delighted to host the delegation at the Patriarchal residence. Following the meeting, the Bishops joined in the lighting of the Christmas Manger and tree and in the Christmas Novena prayer. On Tuesday 16 December, the delegation visited the Caritas Lebanon Head Office in Beirut, where Bishop Antoine-Charbel Tarabay celebrated mass, joined by Bishop Michel Aoun, responsible for Caritas – Lebanon and all the Bishops in presence. 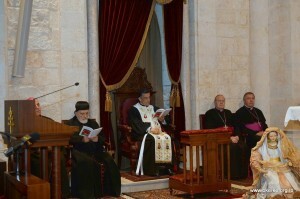 The mass was also attended by the members of the committee for the Iraqi refugees in Lebanon: Father Paul Karam, Bishop Michel Kassarji representing the Chaldean Church, Father Youhanna Battah representing the Syrian Catholic Church, Bishop Elias Sleiman representing the Maronite Bishop of Lattaqieh – Syria, Bishop Gerges Al Kass Moussa representing the Syriac Catholic, Father Yathroun Koliana representing the Assyrian Community and Father Toni Saliba representing the Syrian Orthodox Church, and many refugee families from Iraq and Syria. Following the mass, the delegation met with the families and heard their traumatising experiences as well as their needs. The visiting bishops promised to carry back with them the concerns of the refugees to the Australian government and people. If the international community is unable to intervene and put an end to this situation, more people will be forced to leave their homes, placing an increased burden on the surrounding countries. The delegation also met with the president, directors and staff of Caritas Lebanon and learned about the programs in place for the Iraqi refugees. The team highlighted the psychological trauma experienced by the refugees, mainly the young children, and the very poor financial situation of the Iraqi families who cannot afford the basic daily needs. Caritas Lebanon, along with the Iraqi Churches and some other non-profit organizations, are providing temporary rent assistance to the families but cannot guarantee long-term assistance without further funding. According to the director of Caritas Lebanon Migrant Center (CLMC), the fourth Emergency Appeal launched in September 2014 only raised 200.000USD out of the needed 2.2 million USD. All this has placed a heavy burden on Lebanon and the Lebanese citizens whose jobs and economy have been threatened by the hundreds of thousands of Syrian and Iraqi refugees that have crossed the borders over the last 3 years. In the afternoon, the delegation met with His Beatitude Ignatius Youssef III Younan, the Syriac Catholic Patriarch of Antioch. His Beatitude stressed the urgent needs of the refugees and said, with regret, that the Christians of the Middle East feel forgotten by their Christian brothers and sisters in the west. Following a brief visit to the sanctuary of Our Lady of Lebanon in Harissa, the delegation met with the Apostolic Nuncio to Lebanon, Archbishop Gabriele Caccia, who presented an overview of the current situation in the region. His Excellency spoke about the Lebanese political crisis that has a negative impact on the Christian refugees. His Excellency expressed his joy at the significance of this visit before Christmas, as a reminder that the western churches have not forgotten their brothers and sisters in the land that witnessed the birth of Christianity. His Excellency added that the Western governments must help Lebanon to not get involved in the region’s crisis and to ensure that the Christians are not treated as second-class citizens. The day concluded with a visit to the University of the Holy Spirit in Kaslik, to attend a conference on the current situation of the Christians and their Future in the Middle East, presented by Reverend Abdo Badwi. This was followed by a dinner hosted by Rev Fr Hady Mahfouz, Rector of the University, in the presence of The Right Reverend Abbot Tannous Nehme, Superior General of the Lebanese Maronite Order of Monks (LMO), and attended by the Monks of the Order and the Deans of the University. 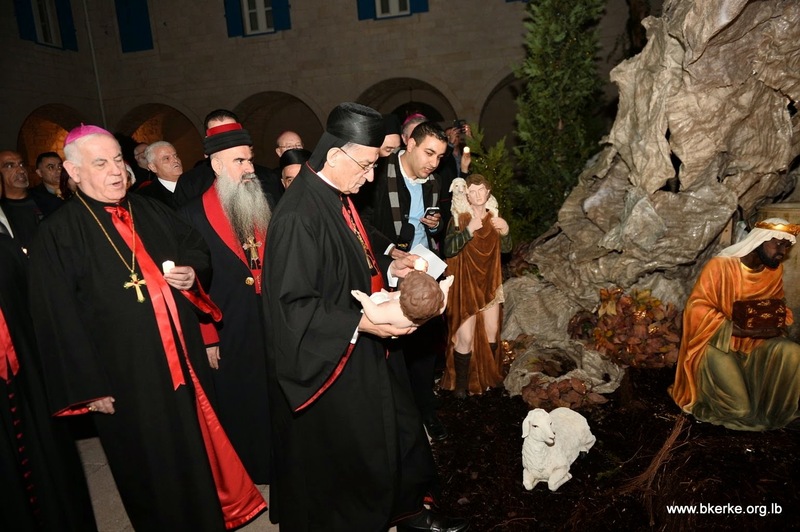 On Wednesday 16 December, the delegation visited St Maroun’s Monastery in Annaya where they celebrated mass and visited the tomb of Saint Charbel. They were welcomed by The Right Reverend Abbot Tannous Nehme, Superior General of the LMO and Fr Charbel Beirouthy, Superior of the Monastery. In his homily, Bishop Julian Porteous asked our Lord, source of peace, to come to the aid of the Christians of the Middle East, and relieve their sufferings and distress, through the intercession of St Charbel. Bishop Porteous also prayed for Lebanon that it may know peace, stability and prosperity to continue to spread its message to the world: that all people despite their differences can manage to live together. Later in the day, the delegation met with His Beatitude Gregorios III Laham, Patriarch of Antioch and of All the East, of Alexandria and of Jerusalem of the Melkite Greek Catholic Church. His Beatitude briefed the bishops about the humanitarian programs and projects in place, and presented a book prepared by the Adyan Center, designed for educators to teach school students how to accept each other despite their differences. Bishop Robert Rabbat hoped that the book would be a beneficial resource for Australian educators. His Beatitude concluded with a plea that the Church unites in seeking peace everywhere in the world and in protecting the rights of the Christians to remain in their land. 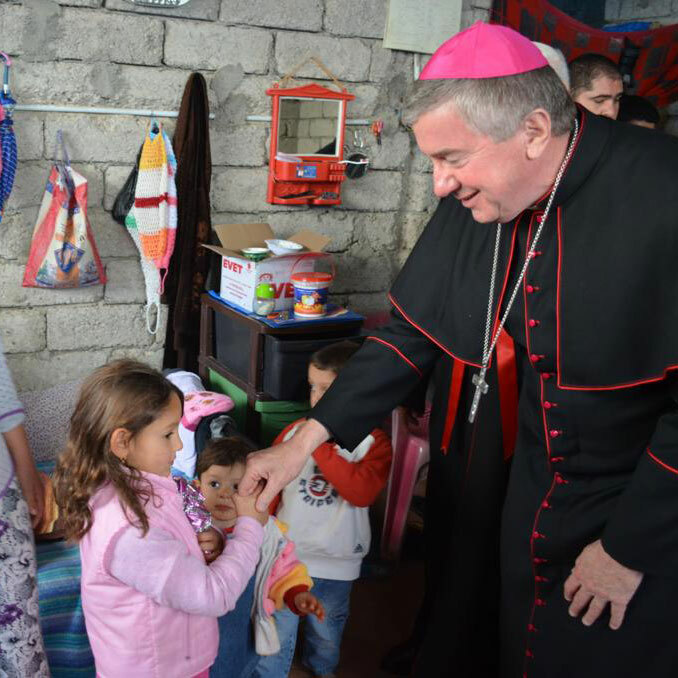 At 2.05 pm the Bishops’ delegation left Beirut to Erbil, Iraq where they will meet with officials and refugee families.